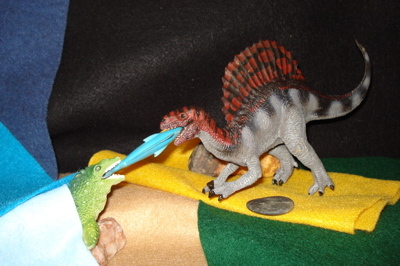 The Carnegie Spinosaurus shows great improvement. 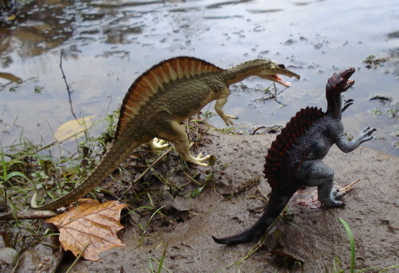 The Carnegie Spinosaurus has come a long way, baby. I remember when it first came out in 1992. It was a brick-orange and the head looked like a "Lincoln-log". It was very thunky. I bought two, and gave them away to my grandchildren's pre-school. It was re-issued in 1996 with a new sculpt and a lot of change. The head was the biggest change but it was all around improved. What more could one want? THIS>> beautiful, new for 2008 sculpt was really more than expected, and possibly hoped for. It is L-A-R-G-E at just over sixteen inches (16") long (not counting "over-the-sail", then it's 17.25") and is extraordinarily 'sleek' in appearance. It tips the scales at exactly eleven ounces (11 oz) and every one of them is exquisite. I really like this figure. A lot. 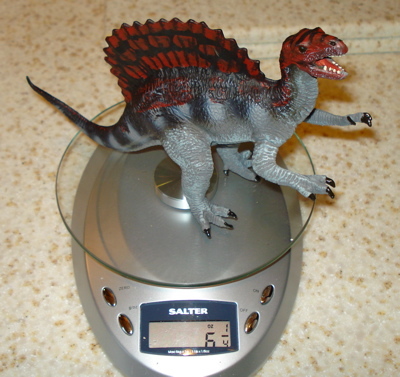 It is very well balanced and will stand in fully bipedal mode on finely sculpted feet. This retails for ~$30.00. 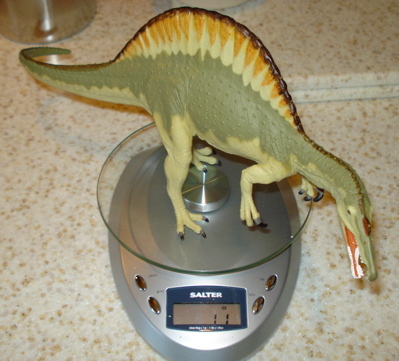 The earlier (1996) model weighs six and a quarter ounces (6.25 oz) and is ten and one-quarter inches (10.25") from snout to tail. It has been out of production for about three years at this point so is probably still available new retail at about $12.00. It should also be found on auction sites and at your usual suspects, garage sales and flea markets. It is heading into collectible territory. 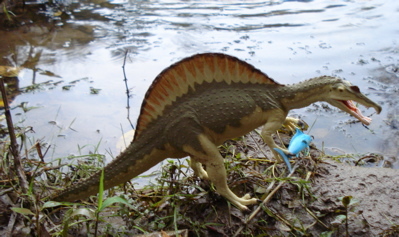 The Spinosaurus is thought to be, primarily, given its teeth-shape and other evidence, a piscavore (fish eater). Although given its great size (upward of sixty feet in length) and weight (9 tons) it seems likely it also would have been an opportunistic predator much like today's great Kodiak bears, being capable of dining on whatever crossed its path. An all-you-can-eat buffet would include the serving trays, servers and anyone and anything else that got in its way. 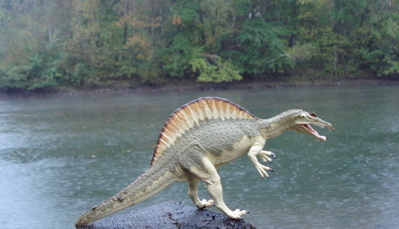 You can learn more about the Spinosaurus, by going here. 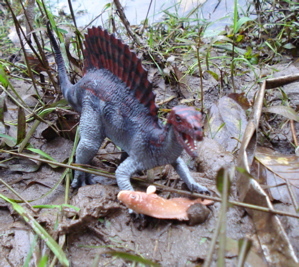 The Carnegie Spinosaurus has to eat too and so the two generations come down to the river in search of food. So whether it is with its long arms and curved talons or its long jaws, the Carnegie Spinosaurus stands unmoving, much like a stork does today, until some foolish fish swims by, for the last time. 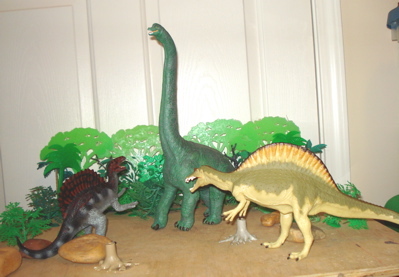 A comparison of the two generations is enlightening (if unfair) but clarifies the improvements made by Safari Ltd. (opens new window) to their Carnegie Dinosaurs line of Dinosaur toys. 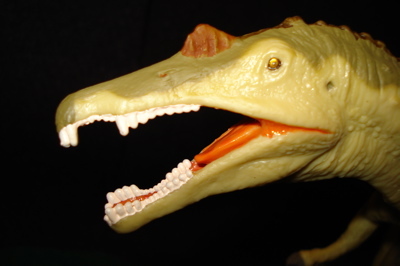 The 1996 model has a relatively short and rounded snout, which was the generic Theropod head in use at the time, with a smattering of teeth. The actual detail is very good for the time but it really isn't any Dinosaur we know. 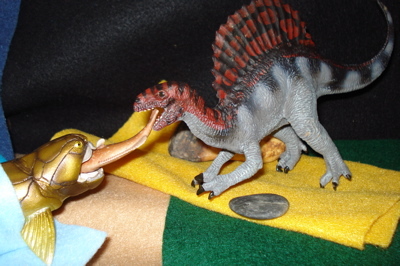 It was as much a Spinosaurus, because it had the sail, as was a Dimetrodon. 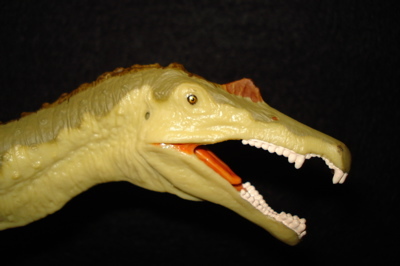 The 2008 Carnegie Spinosaurus has a full complement of properly endentured teeth in a correctly elongated skull. 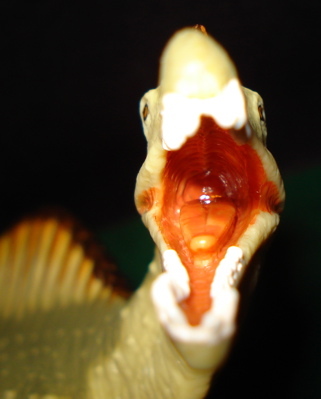 The nostrils are up high on the snout where they belong and there are both ear-holes and a small red crest centered between the nostrils and the eyes. Very nice. 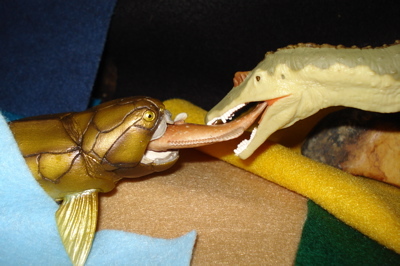 Even the interior of its mouth has a well sculpted tongue and palate. While the "hands" are corrected, with the large, curved interior claw standing out from the other two. 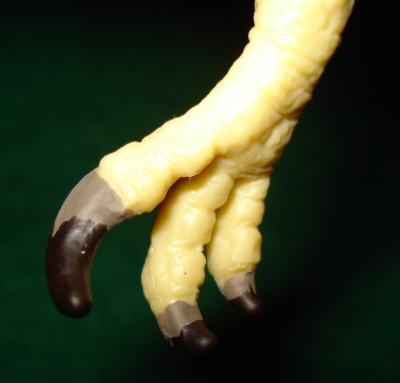 The previous generation displays the generic Theropod paw with the center claw slightly enlarged. It is almost as if these were made by two different companies. The improvement is that great! Thank you Safari Ltd. (opens new window) for making the effort and bringing the Carnegie Spinosaurus into the twenty-first century. 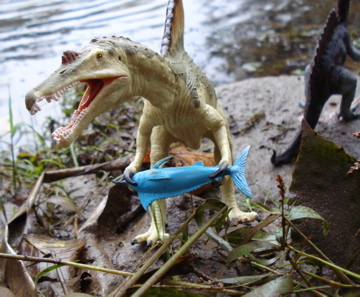 Whether it is wrestling with a Mososaurus or a Dunkleosteus for a fish, the Carnegie Spinosaurus is always up to the task. As you can see this Dinosaur has been inside and out, been through the mud and cleaned off with a garden hose and is none the worse for wear. 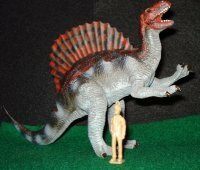 Both of these are terrific toys but the most recent evolution is a true replica of the original and the 2008 Carnegie Spinosaurus by Safari Ltd. rules! 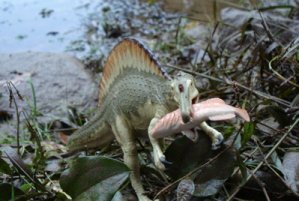 If you are considering adding a Spinosaurus to your collection you won't go wrong with the this newest addition to the Carnegie Dinosaur toys line-up. I like it a lot better than the earlier version and expect it to stand up to the same level of rough play that its progenitors did. 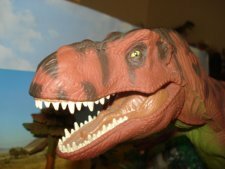 There are many other toy companies that make Dinosaur toys that you might find interesting or desirable and we urge you take a look. 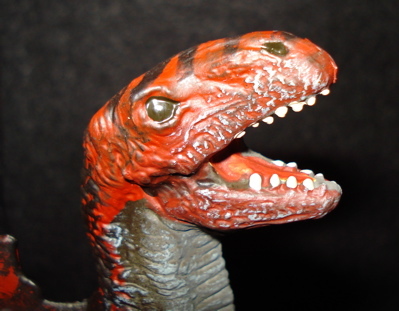 Please remember that The Dinosaur Toys Collectors Guide is here for you. To provide information that you need and want in a fun and enjoyable fashion. look forward into the future perhaps you'll drop us a line and tell us what YOU would like to see. Some remembered, favorite Dinosaur toys or maybe a Dino toy that you are considering for a beloved child or a "coolectible" for yourself.